After over a month of incredible image submissions and thousands of votes, the World’s Dirtiest PC Contest came down to two entries in the final moments before Tuesday’s midnight voting cutoff. Over the last few days of the contest the two leading vote-getters traded the lead back and forth, campaigning hard for their image to win them a new CL100 Fanless Mini PC. This is the point where we’d normally say, “but there can only be one winner”, however rules were made to be broken and this contest was just too close to call. The CL100 was designed to make fanless computing more accessible to everyday computer users and with that in mind we’ve decided to award both of these worthy competitors, who each received nearly 600 votes for their image, the grand prize! Let’s take a look at the two winning entries who will each be receiving a new fanless PC. 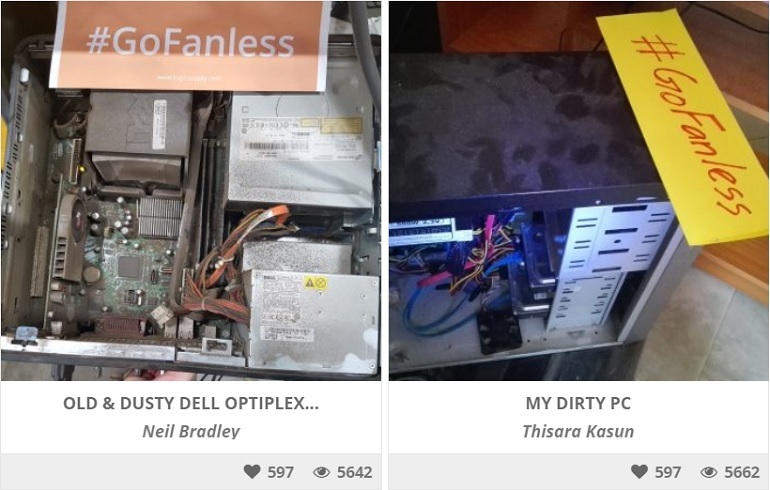 You may remember Neil, and his filthy Dell OptiPlex 775, from his Week 4 prize pack win. Pulled from the production floor of a major tooling company, the system is consistently subject to airborne contaminants and chemicals, pulled in by its multiple fans which results in a grimy coating on every internal surface. Neil is a Mechanical Engineer with Alpine, a division of Illinois Tool Works, and came across the World’s Dirtiest PC Contest while searching for industrial systems to be used in a new project the company is working on. Neil leveraged Reddit, as well as his 1200 Twitter followers to solicit votes for his entry. As for the CL100 that he’ll soon be receiving, Neil is facing the challenge of deciding how to best utilize this versatile device. Our other Grand Prize winner comes all the way from Sri Lanka. Thisara’s picture of his well used Powerlogic 500 PC has been one of the leading vote-getters for much of the contest thanks to his network of supporters, many of whom study with him at the Java Institute for Advanced Technology where he’s pursuing his Software Engineering degree. Because it’s constantly subject to the dusty environment of his village, Thisara is forced to clean the system out regularly to avoid overheating or shorting. After hearing about the contest from a recent Softpedia article, Thisara was able to use a combination of mobile messaging apps, and the power of a popular Google+ community that he helps to moderate, to drum up the votes he needed for his image. As for his plans for his new CL100, it’s no surprise that he’ll be using it to continue to pursue his love of software development. Our two winners show us that, unfortunately, dirty PCs are everywhere. From the process control devices that help keep today’s factories running, to the daily computing machines that most of us use every day, fanned PCs are all vulnerable to environmental contaminants. Luckily, thanks to passive cooling technology, there is a better way. 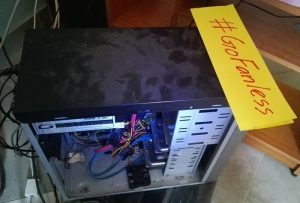 Congratulations to Neil and Thisara, and a huge thank you to everyone who submitted pictures to the #GoFanless Gallery. 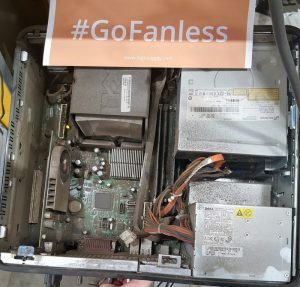 We were excited to hear that many of you are already taking steps to go fanless, including the majority of our weekly winners. There’s no reason to put up with the dust and debris that can destroy your expensive computer, for more information about fanless computing visit our Hardshell Fanless Technology page, browse our line of fanless systems, or call one of our Solution Specialists at 802-861-2300. What’s the Difference Between a Tablet and a Panel PC?